Michael Gray out of office. The IRS gets hacked - taxpayers exposed to identity theft. IRS reevaluating corporate spinoff rules. Supreme Court says retirement plan fiduciaries must monitor investments. Franchise Tax Board withdraws Notice of Proposed Assessment for taxpayers who moved to Nevada. 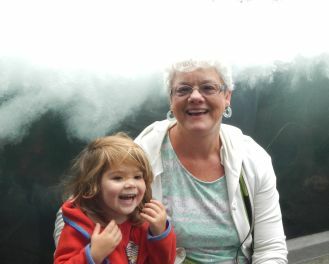 Minerva Siemer with Grandma Janet at the Wave Exhibit at the Monterey Bay Aquarium. This is the time of year for graduations. Congratulations to all graduates and their families. Education is a lifetime experience, so you graduates have only completed an important stepping stone. Your next challenge awaits you. Go for it! With graduations also comes summer vacation. Be careful when driving for more kids on the streets. Michael Gray will be out of the office June 10 through 12, returning June 15. The IRS has warned taxpayers that identity thieves have accessed tax return transcript information of 104,000 taxpayers. The hackers had to have Social Security information, birth dates and street addresses in order to access the IRS site. The hackers were using the IRS's "Get Transcript" application, which has since been temporarily shut down by the IRS. Taxpayers can still write to the IRS for their transcripts. The hackers were unable to access the records for about 100,000 additional taxpayers. The IRS believes the information might be used for filing fraudulent income tax returns to get a refund. The IRS will notify the taxpayers whose information was accessed. They will receive free credit monitoring and the IRS will monitor their accounts for potential identity theft. The corporate reorganization rules were designed to allow active trades and businesses to be divided or combined without imposing income taxes on the shareholders. In recent years, the IRS has been relaxed in allowing tax deferred reorganizations when one or more of the entities have little or no active trade or business activity. A recent high-profile example is the spinoff of an affiliate holding Alibaba stock to Yahoo shareholders. The IRS Office of the Associate Chief Counsel (Corporate) has announced that it is reevaluating whether it will continue to issue private letter rulings approving spinoffs when the corporation being spun off owns minimal assets in a trade or business. As I understand it, Yahoo has indicated it will proceed with its spinoff because it was announced before the IRS announcement of a possible change in policy. The Supreme Court has held the six-year statute of limitations doesn't apply when an employer doesn't offer low-cost investment alternatives to its employees for its retirement plan. The Ninth Circuit Court of Appeals previously applied a six-year statute of limitations for employees to be compensated for excessive fees. The Court found the employer had violated its fiduciary duty under the Uniform Prudent Investor Act. "The duty of prudence involves a continuing duty to monitor investments and remove imprudent ones under trust law." Smaller employers may find this standard too burdensome and discontinue offering 401(k) plans. In the past, some brokerage firms have waived administration fees when plans have offered specified investments from which the brokerage firm received commission income. These arrangements will probably have to be converted to fee-based arrangements and more low-cost alternative investments offered to employees. A business owner and his wife moved to Nevada during April 2007 before receiving $8 million in dividends. The Franchise Tax Board initially claimed the taxpayers had enough connections to California that they were still domiciled in California and subject to California income tax on the dividends. The taxpayers appealed to California's State Board of Equalization. When the Board of Equalization questioned the Franchise Tax Board's position, including disregarding a calendar and 200 pages of supporting documents submitted by the taxpayer, the Franchise Tax Board withdrew its Notice of Proposed Deficiency and the Board of Equalization dismissed the case. The case demonstrates that retaining some connections with California isn't fatal to proving your change of residence provided you can provide good explanations of the reasons for those connections and can establish the legitimacy of your new residence in another state. For example, in this case, the taxpayers didn't sell their California residence until 2010 because real estate prices were down in 2007. They lived in a 2,500 square foot Nevada residence that they purchased for $900,000. It was more than sufficient for the two of them. July 3, 2015, Michael Desmarais, attorney at law, "Your rights as a beneficiary"
July 11 and 18, 2015, Jeffrey Hare, APC, attorney at law, "Settling legal disputes our of court"
July 25, 2015, Lori Greymont, CEO, Summit Assets Group, "Real estate investment alternatives"